Tongs, meaning "halls" were the secret fraternal associations of Chinatown, orginated in Taiwan and Fujian as "triads" back in the eighteenth century. 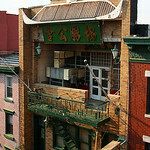 These associations first appeared in Chinatown in the early 1880s. They protected their members' jobs or business interests and eventually evolved into criminal organizations controlling drugs, prostitution, gambling, and loan-sharking. Inside the Hip Sing headquarters were gambling halls offering a variety of Chinese games. 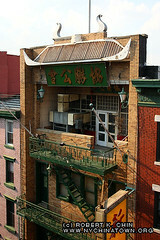 Hip Sing still operates today and participate in the Chinese Consolidated Benevolent Association (CCBA) and is the largest and most powerful associations in Chinatown.